One of my favorite events each year is the annual presentation by our local newspaper of record, the Daily Pilot, of their so-called DP 103 - a list of 103 (actually many more) people, entities, groups, etc. that influence the lives of the lucky folks who live, work and play in the Newport-Mesa area. We're especially lucky this year to have this edition because the Daily Pilot has seen better days. Since the acquisition of the Tribune Companies - the parent of the Los Angeles Times and Times Community Newspapers, of which our Daily Pilot is a part, there have been draconian cuts in staff. In fact, as the DP 103 was being "put in the can" long time staffer, Tony Dodero, was laid off - a truly tragic blow to the Daily Pilot and our community. Still, the staff soldiers on, producing the best product possible under the circumstances. This year's edition has many familiar faces and some new ones. This link, HERE, will take you to the proper page online so you can scroll down and select your favorites to read what the editors and reporters of the Daily Pilot think about your friends and neighbors who made the list. I'm not going to try to write about all of them, but there are a few that I do want to mention specifically. I cannot comment on this edition without giving my opinion of the choice for #1, Frank Barbaro and Scott Baugh. These two gents are the top dogs in the Orange County Democrat and Republican parties, respectively. They call the shots for their parties in all things political. In Baugh's case, that apparently means their attempt to virtually colonize Costa Mesa and use it as in incubator for their political fetuses. I'm not happy about that. I must say, though, that City Editor Paul Anderson's article on them is an interesting read. Perhaps my favorite choice among the top selections is Costa Mesa Director of Public Works, Peter Naghavi. He was appointed to his current assignment this year following a long and, yes, illustrious career as the city's head traffic guy. Over the years Peter has worked his magic, trying to keep residents happy with traffic issues, but not always successfully. It seems that some people will never be satisfied, regardless the number of solutions presented to them. Still, Peter keeps on smiling and, with an excellent staff to support him, he just keeps on making sure the streets are paved and clean and our parks are in good shape. His recognition is certainly well-deserved. Scattered throughout the DP 103 are local and regional politicians, but tucked into the #46 slot, not quite half way down the list, are two women who have made community activism an art form. Cindy Brenneman and Robin Leffler are Costa Mesa residents who take community involvement very seriously and have demonstrated that individuals can, indeed, make a difference. I'll let you read Michael Alexander's summary for more information. Congratulations, ladies, for having your efforts recognized in the DP 103. I cannot scroll down past #68 without comment. Paul Salata and his daughter, Melanie Salata-Finch, run Irrelevant Week, that Paul started more than three decades ago. What began as one old NFL player trying to give the last man chosen in the draft each year a little fun and recognition has become a huge, nationally-recognized event. This honor - which, like Irrelevant Week has become an annual affair - is well-deserved. Thanks to Paul for the idea and to Melanie for the hard work. In the interest of full disclosure, I must tell you that Paul and I attended the same high school, but at different times. I did, in fact, attend with his "baby brother", George. Well done, fellow Panther. On down the line at #77 is my friend - the ultimate Lion - Mike Scheaffer. I think there has never been a day in his life when Mike has not been a Lion - it's in his genes. He's known, of course, as "Mr. Fish Fry", for the efforts he and his Lion compatriots put forth to conduct the annual event at, surprisingly, Lions Park each spring. There's more to Mike's life than fried fish, though. He is knee-deep in many other volunteer activities, including the Senior Center and the Boys and Girls Club. He grew up here, has a business here and raised his family here. Mike lives and breathes Costa Mesa and I'm proud to call him a friend. This recognition is certainly appropriate and much deserved. Fortunately, it's nice to be able to cleanse one's literary palate with the next selection, #94. The two women recognized in this slot, Karen McGlinn and Jean Forbath, could be considered the antithesis of the previous person. Their organization, Share Our Selves (SOS) is the gold standard for helping others in our area. We should all be proud of the fine work they do helping their fellowman - I am. I cannot close without acknowledging my buddy, Byron de Arakal, who made the list at #102. When I contacted him to congratulate him for this fine award he commented that he was last on the list, #103, about 10 years ago, so he hoped to break into the top 10 sometime after he's been in the ground for 20 years or so. What a guy! Byron is the reason you're reading these words - it was a column of his in the Daily Pilot almost ten years ago that caused me to write my very first Letter to the Editor, which was published. I thought, "Heck, that was easy! ", and kept on writing, which eventually evolved into this little old blog. The little blurb that accompanied Byron's photo outlined his contributions to our area as a member and Chairman of the Costa Mesa Parks and Recreation Commission, which were prodigious. His personal focus has always been on the kids of our community. I cannot get him to slow down in his consulting practice so he can run for City Council - maybe some day. Again, congratulations to every one of the people and entities honored by the Daily Pilot as members of the DP 103 for 2008. I love reading about the contributions of so many of my friends and neighbors, and those of folks I've never heard of before. This special section will have a long "shelf life" online, so take your time and read about all these wonderful people who make the Newport-Mesa such a terrific place in which to live, work and play. Thanks to the men and women of the Daily Pilot, now headed up by Brady Rhoades, for persevering under very trying circumstances to produce this fun, informative Special Section. 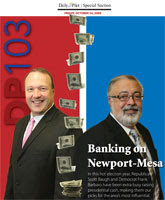 I'm sure it will remain on coffee tables and in book racks in homes around the Newport-Mesa for a long time. Congratulations for a job well-done. Well Done, Halecrest and Mesa Del Mar! Last night's Costa Mesa City Council Candidate Forum hosted by the Halecrest Community Association and the Mesa Del Mar Homeowners Association was a big success. Congratulations to the organizers for a job well done. Held in an un-air conditioned room - with lots of open doors and fans - it got off to a slightly delayed start, but moved briskly thereafter. The venue was just right for the crowd - probably around 80 residents showed up for this event, including one old grouch from Mesa North who made what he must have felt was an obligatory appearance, then skulked away at least an hour before the event ended. Perhaps sitting on the far LEFT side of the room gave him vertigo - who knows? Eight of the nine candidates made it to this event. Mayor Eric Bever failed to show, which is getting to be a habit with him these days. You'll recall that he didn't show up for the Daily Pilot interviews recently, either. I'm thinking he may have finally run out of jokes or "clever" quips, so felt that he would be making an appearance "unarmed" - like a gunfighter without his pistols. Or, perhaps, his unwarranted arrogance just got the better of him and he didn't feel it was necessary to make another appearance before the voters of this city. He wasn't missed. Each candidate was given two minutes to introduce themselves - that worked out just fine. Having been to most of these events, I heard nothing new, but many of the attendees were first-timers. From that point on the hosts asked questions that were important to them and their communities, ranging from their approach to balancing the city budget; alleviating speeders in neighborhoods; the vacant property where Kona Lanes once stood; high density apartments in Mesa Del Mar; Banning Ranch and Undergrounding utilities. They each had two minutes to wrap up at the end. The proceedings were quite civil - more so than in previous forums. Bill Sneen came armed with a few big expensive fliers for Righeimer, Monahan and Bever and commented on them in contrast to his campaign. Monahan took a couple mild backhand swipes at Katrina Foley again, but generally it was a pretty darn civilized exchange of views all evening. Lisa Reedy, on her home turf and before a home crowd, took a much more affirmative and active role in the discussions tonight. I found myself wishing she had launched her campaign more aggressively earlier. I thought it was interesting that, during the discussion of Undergrounding the utilities, all the candidates thought it was a good idea, but too expensive, yet none of them put forward what that cost would be. I expected Foley or Monahan - or both - to tell the assembled crowd that Allan Mansoor's pipe dream of undergrounding the utilities throughout the city would cost more than $1billion and take at least a generation to complete - those were the last numbers we heard when this was being considered. Yikes! And those numbers do not take into account the cost to the individual property owners, who would have to pay to get the utilities from the curb to their homes. In my case, for example, I received a couple estimates in the $11,000 - $15,000 range. Those costs will have certainly gone up since then. That subject is dead and "buried" - sorry, couldn't resist. To no one's surprise, opinions varied on Banning Ranch. Chris Bunyan - who again lead the field in snappy one-liners - is leading the charge to keep Banning Ranch open space. Jim Righeimer, a developer, is more realistic - citing the fact that this is really Newport Beach's issue because the ranch property is within their sphere of influence. He pointed out that Costa Mesa must work with Newport Beach and the developer to obtain funds to mitigate the impact on our streets and other infrastructure during the process. On the subject of the high density housing in the Mesa Del Mar area, there was unanimous agreement that stronger code enforcement is necessary. Several candidates thought stronger codes were necessary in addition to stronger enforcement of our existing rules. Foley and others felt that stronger positions should be taken with the property owners, including those owning the underlying property in the case of land leases. Monahan opined that eventually those units would simply just be "scraped" and new, upscale housing built in place. There were several amusing moments tonight. One came from Nick Moss, the youngest of all the candidates at age 28. During the ad hoc discussion of Fireworks, he talked wistfully about how much he and his neighbors enjoyed the safe and sane fireworks, he said, "We have a blast." and never batted an eye. I'm still not sure he realized the humor in his comment. So, neighbors, one more forum to be held next Tuesday, the 28th, at the Presbyterian Church of the Covenant, on Fairview next to the Farm Sports Complex. That event begins at 6:30 according to the revised schedule. I find myself wondering whether Bever will ignore this group, too. Is it too much to expect that the mayor actually attends these things when he's running for re-election? I don't think so. In any event, I'll remind you about that last forum as the date approaches. As an aside, at the end of the last council meeting on Tuesday Bever demonstrated just what a chucklehead he really is when responding to City Manager Allan Roeder on the subject of shopping in Costa Mesa. Roeder, making light of a comment made earlier by the Mesa North Mouth that folks could soon visit the new Trader Joe's in Huntington Beach, indicating that we should be shopping at our own Trader Joe's on 17th Street. Bever, in an unnecessary and flippant reply, said the one in Huntington Beach was closer and it would take too much gas and he would pollute the air too much if he drove "all the way" over to 17th Street. Yes sir, that's your mayor - advocating driving out of town to do your shopping. "Clueless" is much too kind a word for him. By the way, during the last council meeting after about five minutes of discussion the council decided to simply cancel the November 4th meeting. That's election day and most of them will be preoccupied one way or the other. The next scheduled City Council meeting will be on November 18th. 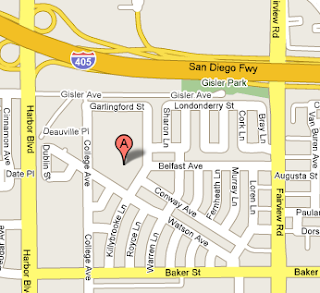 Just a reminder... the next-to-last Costa Mesa City Council Candidate Forum will be held tonight. Wednesday, October 22, 2008 the Mesa Del Mar Homeowners Association and the Halecrest/Hall of Fame Community Association will jointly host a candidate forum at the Halecrest Community Center, 3107 Killybrooke Lane, from 6:30-9 PM. Incidentally, the start time for the final forum next Tuesday, the 28th, has been pushed back. I've been advised that it will begin at 6:30 PM, not 6, as previously reported. I'll remind you next week. A little more news on the departure from the Daily Pilot yesterday of Tony Dodero, Director of News and Online. I imagine the management of the Times didn't just push him off a cliff. I don't know, but I suspect he was able to participate in a buy-out of sorts that may provide a small cushion as he takes this next step in his life. That would be consistent with the way The Times treated folks pitched out onto the streets since Sam Zell began his ham-handed "massaging" of the Tribune Companies. The OC WEEKLY, those good and prescient folks that recently recognized this humble blog, had an interesting piece on Tony's departure in their Navel Gazing segment. Here's the link to that article, which includes a very interesting comment from Bill Lobdell, former Editor of the Daily Pilot, who recently found himself in similar circumstances. Again, we here at A Bubbling Cauldron wish Tony Dodero and Lana Johnson, who also was shown the door this week, all the best. Katrina Foley put it so well last night when she paid much-deserved tribute to Tony during her council member comments, indicating that he was an important member of our community beyond his role at the Daily Pilot. He will be missed. A REMINDER AND THREAT FROM "THE MOUTH"
"A few years ago we h elped elect a politician who did say one thing and do another. That politician even said he believed that we were the reason he got elected. However, he apparently forgot that we do pay attention and we do attend most meetings and we do listen and we do watch. As soon as it was clear that this politician wasn't walking the walk and was blowing smoke, we began working to make sure he would not serve another term. We went from being his biggest supporter to being his biggest opponent." This should be a reminder to all those he supports in the election that he believes he has the power to get you "un-elected" if you fail to toe his line. Are you listening, Eric, Gary and Jim? You should be! It should also be a reminder to the voters of this city of just why perpetuating an "improver" majority on our council is not good for this city. It puts them under the thumb of man admired by David Duke, former head of the KKK, for goodness sake. Is this the image you want for your city? I've written from time to time recently about the sad days at the Los Angeles Times and it's covey of community newspapers, including the Daily Pilot - our newspaper of record for a century. Sam Zell bought the Tribune Companies, including the Los Angeles Times, the Chicago Tribune, the Cubs and Wrigley Field, plus other media assets - like our local KTLA, Channel 5. Ever since that acquisition Zell, who has no clue about how to actually run media companies, much less in these perilous times, has begun a herky-jerky process of devaluing those assets. I'm not sure how that makes any sense, but that's what he's doing. For example, a year ago the Los Angeles Times newsroom was staffed by 1200 writers, editors, photographers and others so essential to the gathering and presentation of the news. Today it is under 650, with another 200 people to be turned loose this week. Among those dedicated news folks being released this week is my friend, Tony Dodero, Director of News and Online at the Daily Pilot! After 18 years with the organization, Tony will walk out the door today for the final time and into a future with great uncertainty. Sadly, he's not alone in this situation these days. You will recall that when Publisher Tom Johnson resigned in protest of the draconian cuts being manifested on the Times and it's subsidiaries earlier this year it was left to Dodero to grab the helm of the Daily Pilot and it's sister publications to try to keep them focused and functioning. He did a great job with a very difficult situation. His reward for this loyalty is a pink slip. Such is life at the Los Angeles Times these days. Tony began at the Pilot as an intern for a few months almost 20 years ago, was offered a full-time job and progressed through the ranks as his talents were recognized. Over the years he's moved around through the Los Angeles Times organization with stops in Huntington Beach, Long Beach and Santa Monica. He's built new organizations - the Times Community Newspapers were a group of 23 individual newspapers at one time. He became Editor of the Daily Pilot in 1999. Throughout his career in the Los Angeles Times organization he became known as a tenacious reporter, excellent writer and editor and a superior manager. Along the way he has also become known as a good friend to many who have worked for and with him. When it became obvious that the Daily Pilot needed to develop a better, more professional online presence Tony was the "go to" guy and he responded by creating an online entity that is excellent and serves it's readers well. Throughout his career Tony has hired and nurtured some excellent young reporters and editors, most of whom have moved on to bigger things after earning their spurs at the Daily Pilot. This skill for recognizing and developing talent is one of Tony's strengths. For most of this decade he has taught a Beginning Journalism course at Orange Coast College, where he encouraged and educated young folks with an interest in journalism. During a conversation today Tony told me that he will miss the people the most. He said he's enjoyed getting to know so many wonderful people over the years and especially enjoyed serving our community. As if pouring that last grain of salt in an open wound, the powers-that-be at the Los Angeles Times have refused to let Tony write a parting column - a courtesy he, as Editor, has provided to many former staffers as they moved on. It's a shame they chose not to permit him to say thank you to the readers after all his years of exemplary service. This is a perfect example of the callousness of those in charge of a once-great newspaper. Since I began writing Letters to the Editor to the Daily Pilot early in 2001 I've gotten to know Tony Dodero and consider him a friend. He's blessed with a cadre of caring, supportive friends and a wonderful family. We know Tony will land on his feet. We thank him for his contributions to our community and wish him, and his family, only the best as he steps off into a new direction in his life. Fasten your seat belts and get comfy... this is going to be a long one... I had planned to publish my choices for Costa Mesa City Council a little closer to the election, but the Daily Pilot forced my hand today. Originally, I thought I would wait until after the next two candidate forums on the 22nd and the 28th, but many will be mailing absentee ballots soon and - unless one of the candidates really steps in it over the next couple weeks - I already know how my votes will be cast, and why. In the Sunday, October 19, 2008 edition, the Daily Pilot editors provided readers with their choices for the open City Council seats in Costa Mesa and Newport Beach. In both instances there were surprises. I'm not going to address the Newport Beach selections - I've only followed them peripherally and I don't have a dog in that hunt. Costa Mesa, however, is another question. The Daily Pilot editors chose to endorse Katrina Foley, Jim Righeimer and Gary Monahan from among the nine candidates for three seats available. You can read the reasons for their selections HERE. You can also view the video of portions of their interviews HERE, which may help you with your own decisions on November 4th. The editors, wisely, chose not to support first-term councilman and current mayor, Eric Bever for re-election. Some will speculate that they did so because he snubbed them during their interview process. I seriously doubt that's the case, but even if it is, it would be understandable. 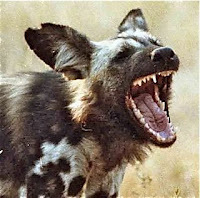 Bever has proven to be a petulant, arrogant and capricious member of the city council, more concerned with providing a smug quip for every event than exercising sound judgment in the administration of our city. I concur with the editor's choice to ignore Bever . I will not vote for him because our city deserves much better. I agree with the Daily Pilot that Katrina Foley, through her citizenship and service to this city as both a planning commissioner and council member over the past nearly a decade, has earned the right to be returned to the dais for another four years. As the editors stated, she seems to be omnipresent, representing our city government at almost every event of significance throughout her term - the only council member to do so. Foley has clearly been the smartest, best prepared of the current council members and, although consistently outnumbered on important votes, she nonetheless has provided solid reasoning and an essential counterpoint to the sometimes-irrational views and votes taken by the current majority. As the candidate who captured the most votes four years ago, she has done an excellent job of insuring that all sides of an issue were heard, giving voice to many residents who's opinions would otherwise have been ignored by the majority. As a business owner/lawyer, wife and mother, she has demonstrated boundless energy and a very special ability to juggle the demands of job, family and city. 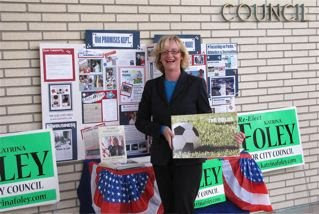 I whole-heartedly support returning Katrina Foley to the city council. EXTRAORDINARY POOL OF CANDIDATES From here on it gets a little sticky for me. This cycle the voters have had an especially unique group from which to choose their next leaders. In my more than three decades in Costa Mesa I don't recall a panel with so much relevant experience. This year we have three previous council members, including two with mayoral experience, and an uber-operative of the Orange County Republican Party who makes the word "connected" sound strangely inadequate. Combine those with a previous candidate who has become a dedicated activist, two mature, solid citizen business leaders and two bright young men with strong futures in civic affairs and you have an extraordinary group from which to choose. I have been, and continue to be, critical of both Righeimer and Monahan, but for very different reasons. I'll discuss them individually, even though they are being presented to the voters, along with Bever, as a de facto slate. As a check of your mailbox each day will illustrate, the three of them are beneficiaries of mountains of money being spent by the OC GOP on their campaign. 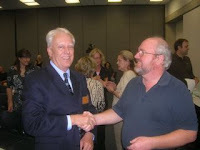 I have described Jim Righeimer as a carpetbagging opportunist and well-connected political operative who chose Costa Mesa as a safe haven in which to perch awaiting a higher office to open up. I have described him as impatient, to the point that he has verbally abused applicants before the planning commission during his brief tenure. I have described his appointment to the commission by Allan Mansoor, after having resided in Costa Mesa for only a few months, as an act of political payback for the help Congressman Dana Rohrabacher gave to Mansoor and Wendy Leece two years ago in their campaigns. Did I mention that Righeimer is Rohrabacher's campaign manager? I have also said that I don't really believe he has a long-term commitment to Costa Mesa. I still believe all of the above. I also don't like the fact that he appears to be a big part of a grand plan by the Orange County Republican Party - my party - to take over the government of Costa Mesa and use it for an incubator in which their cadre of political fetuses will grow. All that being said, there can be no dispute that Righeimer brings almost unprecedented experience for the voters to consider. As a developer, he has a very special perspective on those kinds of issues that is especially valuable in our city at this time. Beyond that, he has exceptional experience in regional organizations and all the important contacts that go along with them. He is an articulate, clever guy who knows how to "sell" his point of view. He's a personable fellow with plenty of charm and a beautiful family, which we've all seen in the numerous political mailers stuffing our mailboxes these days. So, keeping my fingers crossed until they turn white due to lack of circulation, I'm prepared to vote for Jim Righeimer and hope he will, as he promises, become a voice of mediation on the council. I'm prepared to vote for him, then stand back and hope it doesn't blow up in my face. I'm prepared to vote for him, then call him out if he strays from the promises he's been making to the voters in our city. Ouch, my fingers hurt! I understand why the Daily Pilot editors chose to support Gary Monahan's return to the City Council. Simple logic tells you that someone with a dozen years on the City Council previously, including a third of that as mayor, should be a good move for our city, right? During his campaign Monahan has consistently touted his vast experience on various agencies and boards that were part of his previous council terms. That should be important, too, right? Well, I watched Gary Monahan during most of his previous tenure on the council and those memories have left a very unpleasant after-taste. I've watched him evolve from a rank neophyte with limited political skills into a cunning, and sometimes conniving, operator with a very unbecoming streak of vindictiveness. I saw him become the very reason the voters of this city passed a term limits ordinance. I also watched as he stood before the city council a year ago as a private citizen and lobbied hard to get them to place the issue of a directly-elected mayor - without term limits - on the ballot this November. As he stood and spoke as if he was still a council member, pushing hard for this issue, I found myself thinking that he was attempting to become "mayor for life". 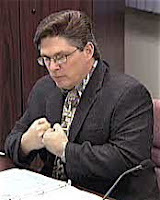 Allan Mansoor supported Monahan, but Eric Bever's choice not to support this subject killed it - for the time being. There is no doubt in my mind that, if re-elected to the city council, Monahan would quickly launch yet another move to have the position of mayor become directly-elected, and without term limits. In my view, this would encourage corruption, perpetuate mediocrity and would certainly be bad for our city. Having watched Monahan at the end of his previous term, it was clear that he had lost interest and he stated, as he stepped aside from a leadership role to make room for the Mansoor/Bever team, that he needed to spend more time with his prodigious family and his business. All of us can understand that, but I wonder what has changed? The size of his family has not, and his business - like many today - probably needs even more of his attention in light of the downward spiral of our economy. I remember Monahan during the rancorous days when his restaurant was being picketed by activists opposing Mansoor's bogus immigration screening plan. He's bitter to this day about that, as evidenced by his comments at candidate forums this year. I wonder how that animosity toward Latinos in our city will translate into even-handed governance in the future? I also remember Monahan's growing impatience with the process of governing - something that happens to folks that have become weary of a "job". I recall with crystal clarity one evening when he admonished his peers on the council, while discussing the subject of annexation of portions of the county coveted by both Costa Mesa and Newport Beach, that they should "play hardball" with Newport Beach representatives, even though Newport Beach held all the cards in that game. That's the kind of attitude we can no longer afford as we deal with our neighboring cities. We need cooperation, not confrontation, as we move forward on issues like John Wayne Airport, the SR-55 solution and Banning Ranch, just to mention a few. 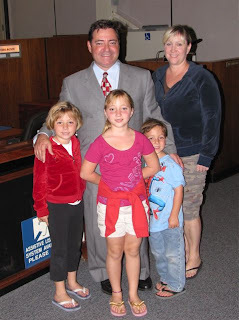 It is my understanding that, if elected to the city council, Monahan will remain on the board of the Costa Mesa Sanitary District, where he will be entitled to draw over $1300 per month, depending on the number of meetings he attends. Combine that with the honey pot he will have as a council member - $952 per month, plus expenses and the availability of excellent medical benefits for his family and the opportunity to pad his pension, and I just cannot help but think that he's in this for Gary, not for the city. I will not support Gary Monahan for re-election because I think he's weary of the job. He has worn out his welcome and is just trying to elbow his way back to the municipal trough. Thanks for your prior service, Gary, now please step aside. This leaves us with five candidates for the remaining choice on my ballot - Lisa Reedy, Chris McEvoy, Nick Moss, Chris Bunyan and Bill Sneen. I think Lisa Reedy - a woman with excellent business and leadership skills - has not gotten serious enough early in her campaign and it shows in her performance at forums. I hope she decides to run again in two years. I'm grateful to her for making this run and hope she will do so again soon. I cannot vote for her this time around. Chris McEvoy is a delightful, refreshing young man to whom the future of this city belongs. He has some unique ideas about solutions to city issues and promises to stay involved in civic issues following the election. I hope he does, and that he returns as a candidate again soon, but I cannot vote for him this time. Nick Moss is another young man who is still on the steep part of the learning curve on municipal issues. I hope he finds a way to stay involved, but this is not the right time for him on the council. He won't receive my vote this time. That leaves us with Chris Bunyan and Bill Sneen, both of whom I like very much as individuals and as candidates. Chris Bunyan ran two years ago and finished last. This year, with saving the Banning Ranch as a cornerstone of his campaign, he seems to be working much harder and has been making inroads. His comments at the recent forums consistently drew the best responses, so he does strike a chord with voters. I think he can continue to make significant contributions to our city. Should he somehow manage, in the face of such stiff competition this time around, to round up enough votes to land a seat on the council I would not be unhappy, but I will not vote for him this time. As he said at a recent forum, Bill Sneen has lived in Costa Mesa twenty years longer than Jim Righeimer and is a business executive, community activist and family man. He is the husband of recent school board member, Linda Sneen, and the father of two college-age sons - both Eagle Scouts. He and his wife have been active in school issues for many years. He possesses excellent business leadership experience and the intelligence, maturity and work ethic so necessary to make solid decisions for our city. He has worked harder than any other new candidate trying to prepare for the forums this year, interviewing many senior city staffers and former municipal leaders and residents. From all I can discern, his slogan, "Costa Mesa First", accurately describes his commitment to improving our city for all residents ahead of any personal political ambitions. By any definition of the phrase, Bill Sneen is a "solid citizen" and precisely the kind of person we should hope to elect to our city council. For all of these reasons he has earned my remaining vote. So, there you have it. I will mark my ballot for Katrina Foley, Jim Righeimer and Bill Sneen because I think the combination of skills, experience, and leadership they individually and collectively bring to the dais may go a long way to moderate the divisiveness and rancor that has existed over the past few years. The challenges that face Costa Mesa in the near future will require a city council that can set aside individual bias and make decisions that serve all the stakeholders - residents, business owners and visitors, alike. I think Foley, Righeimer and Sneen can be the nucleus of that team.